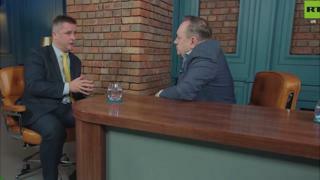 Image caption Mr MacNeil (left) has previously appeared on the RT show hosted by former SNP leader and Scottish first minister Alex Salmond. An SNP MP has insisted he will continue to appear on the RT channel despite his party's Westminster leader describing it as a "tool of the Russian state". Angus MacNeil said the best way to counter propaganda was to go on and give a "counter message". Speaking on Radio Scotland, he added: "Many people have issues with the BBC, but I am talking to it right now." He did not directly answer whether he believed that Russia was responsible for the Salisbury nerve agent attack. Mr MacNeil was speaking to the BBC's Good Morning Scotland programme the day after the SNP's Westminster leader, Ian Blackford, told the programme it was clear Russia had been responsible for an "act of state terrorism" and called for tougher sanctions to be imposed. Mr Blackford also said it was "now clear what the Russian authorities have been up to in the United Kingdom", and urged people to "think very carefully about being seen" on RT. Mr MacNeil has appeared on the channel in the past, as have MPs from all of the main parties, and is an ally of former SNP leader Alex Salmond, who hosts a weekly show on RT. The Western Isles MP heavily promoted Mr Salmond's recent crowdfunding appeal, which raised £100,000 to pay for his legal action against the Scottish government over its handling of sexual misconduct claims that have been made against him. Mr Salmond strongly denies the allegations. When asked whether he would now stop appearing on RT, Mr MacNeil replied: "No, I will talk to any media. Many people have issues with the BBC but I am talking to the BBC just now and I will talk to any media at all if it is there and possible." He later added: "I think it is above my pay grade to go around and to be able to hold inquiries into every media channel." 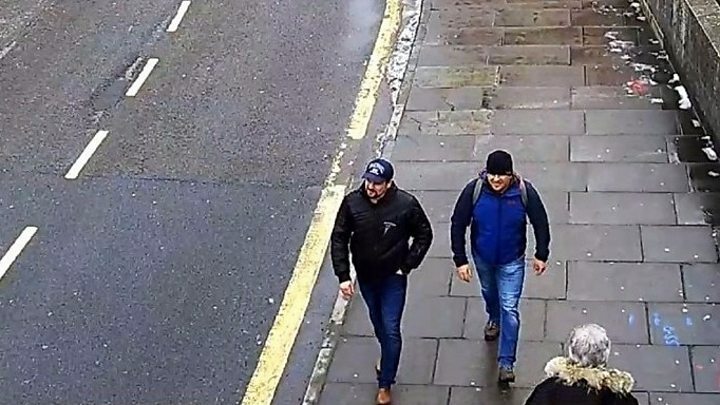 The UK government says there is clear evidence that two members of Russia's GRU military intelligence service were responsible for the novichok attack on former Russian spy Sergei Skripal and his daughter Yulia in Salisbury on 4 March. Both recovered after spending several weeks in hospital. Det Sgt Nick Bailey also fell ill after responding to the incident, while the attack was linked to a separate novichok poisoning on 30 June which led to the death of Dawn Sturgess. Russia has described the evidence of its involvement which had been presented by the UK as "lies". Mr MacNeil, who is a member of Westminster's joint committee on national security strategy, said: "Some people might have clear evidence of the work of the secret services of many countries, perhaps even the UK." He responded: "The best way to counter anybody's propaganda is to go on and put a different message, and perhaps a difficult message for them as well, and not let them carry on with their propaganda. "Because if we only talk to our friends all we will have is a single unitary voice ,that is very much in a very narrow segment of society, so I think we have to have broader voices. "If that is happening with Russia, get onto RT and say that is happening so that their propaganda, if that is the case, is not as easily put because you put a counter message on RT and not just the message that perhaps the Russian government will like to hear on RT." Another of Mr MacNeil's SNP colleagues, Glasgow South MP Stewart McDonald, has faced criticism from some independence supporters on Twitter after questioning the decision by former Scottish Socialist MSP Tommy Sheridan to host a show on the Russian-owned Sputnik radio station. Mr McDonald, who is the SNP's defence spokesman, has also been highly critical of Mr Salmond's RT show, and has previously written that there was a "prima facie case that Russia has sought to exploit Scottish independence as part of a wider push to destabilise western institutions". He has also previously said an independent Scotland would stand up to Russia and would have backed Theresa May's stance over the Salisbury attack.